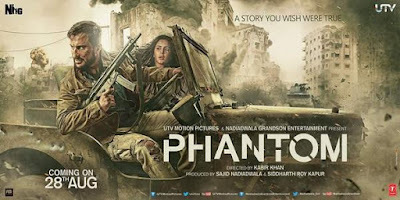 "UTV Motion Pictures" and "Nadiadwala Grandson Entertainment" are presenting most awaited Hindi Bollywood Film "Phantom" starring Saif Ali Khan and Katrina Kaif in Main lead role. The movie is directed by Kabir Khan and It's produced by Sajid Nadiadwala. The movie is about the post 26/11 attacks in Mumbai and global terrorism. The screenplay is written in co-ordination with author Hussain Zaidi. The film will releases on August 28th all over. 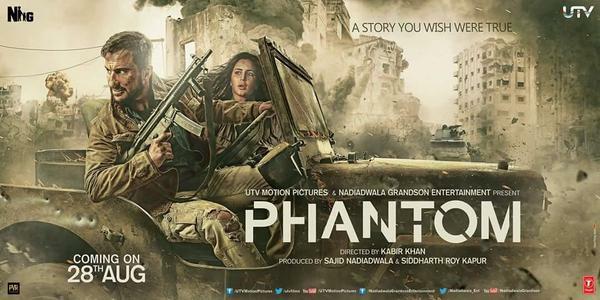 Phantom is an political thriller set in the volatile climate that exists in South Asia. Constant terror attacks against India have left the Indian people feeling vulnerable and angry. The Indian government and security agencies are helpless as the masterminds of the attacks are out of reach. When an infiltrator with plans to attack India is caught, the Head of India’s security agency and his team take matters into their own hands. The film follows the protagonist Daniyal, whose journey to seek justice takes him to India, Europe, America and the volatile Middle East. Local assets in various countries help Daniyal, including Nawaz Mistry who works for an American security agency. Daniyal and Nawaz are drawn into a battle of wits with a shrewd and ruthless enemy. With the enemy hot on their heels, Daniyal and Nawaz against all odds try and finish the job they had set out to do. Along the way they find out that in a mission like this there is always a price to pay, in this case a very personal price.